There is a wealth of genealogical information buried in the stacks of old newspaper stored in various libraries worldwide. Depending on whether you live in the same place as your ancestors, accessing these archives could be exceedingly difficult, and of course physical newspapers don’t have a search button. Nowadays, however, there are a number of initiatives to digitally scan and make accessible newspapers large and small from across the world. Some of these efforts are commercial and require payment to use, while some are funded through non-profit organizations or universities and are free to access online. 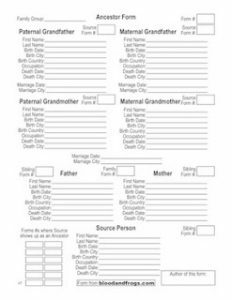 In the past there were efforts to index obituaries, and while obituaries can contain many genealogical clues inside, these new fully searchable newspaper databases can contain much more information. It’s been my observation that if you had family living in a small communities, then these searchable newspapers can be even more useful. Small community newspapers tend to cover a lot more of what is going on with people in the community than larger community papers that cover news on a much smaller percentage of people in the community. On of the best resources I’ve found for searching newspapers across the US is GenealogyBank.com. It is a commercial service, but they earn their money by constantly adding new content to the site. They currently have over 4500 newspapers online. It costs about $56/year for the service (go to their subscribe page, then try to close the page and it will offer to a 20% discount bringing the annual price from $70 to $56) which I think is quite reasonable. You can also try it out for 30 days for free. In addition to newspapers, they also have some historical books, documents and their own version of the Social Security Death Index (SSDI). The best part is once you find a newspaper page with something relevant to you, you can simply down the page as a PDF to your computer. What I do when sharing a page with relatives is I open the PDF and use the built-in annotation features of the program I use (I use Preview on the Mac, but Adobe Reader should be able to do the same thing) to create a red box around the part of the page that contains information on my relative. The reason this can be important is that if you’re sending a large newspaper page it can be hard sometimes to find the part of the page that contains the information you’re trying to relay, especially with older newspapers that can be very dense and hard to read. See an example to the right. First you have the date, formatted as YYYYMMDD which is easily sortable. 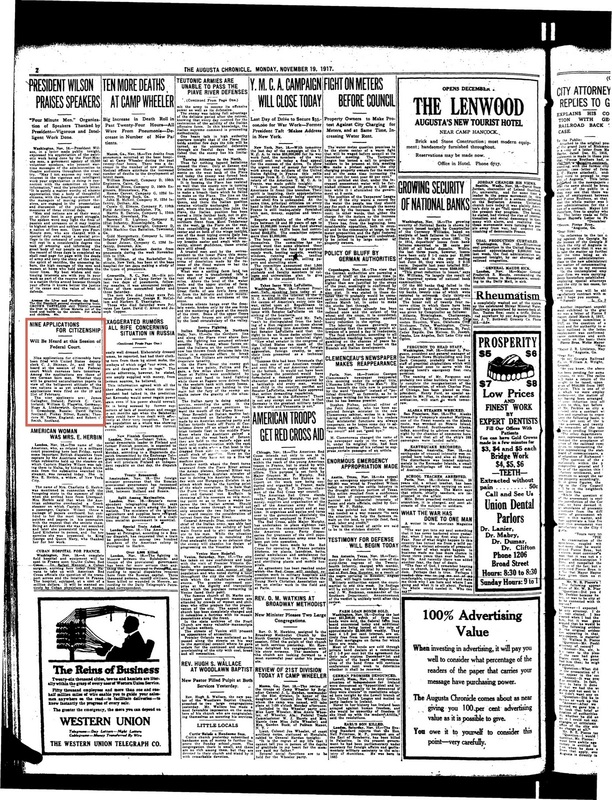 I then add the newspaper name – in this case the Augusta Chronicle (from Georgia) and then a short summary of what is in the article. Thankfully we’re not restricted to something like FILENAME.PDF like in the old days. As you collect newspaper articles from different sources, you can put them all in one directory and see them easily sorted by date of publication, see which papers they came from and who is mentioned in them. It makes finding the article you’re looking for much easier later on when you want to send that one relevant article to a relative. GenealogyBank.com is not the only game in town. There are other commercial services, some larger genealogy websites like Ancestry.com also have newspaper archives included in their databases, but more interesting I think are the smaller initiatives that you need to really search for in small towns and on the state level. For example, as I mentioned in a previous post, there is a project in the state of Georgia called the Digital Library of Georgia run by the university system of Georgia. The site contains digital archives of several local Georgia newspapers, searchable and viewable using the DjVu plug-in. You need to install a DjVu plug-in for your browser in order to use these archives, but once you install it it’s fairly easy to use. It’s not as easy as being able to view the newspapers online and then download a PDF, however. You can download the DjVu files (which are very small) or convert them to TIFF files (which are absurdly large in this case). If you do have the DjVu plug-in convert the image to a TIFF, keep in mind that it does not use compression. Simply opening the TIFF in an image editor and activating LZW compression for the TIFF will save a lot of space, and won’t affect the quality of the image. In Preview on the Mac all you do is open the file, select Save As… from the File Menu, select LZW from the Compression menu as shown in the image on the left. You can also save the image as a JPEG or whatever format you want. I would suggest perhaps converting the image to a JPEG when e-mailing the image to a relative, but you may find it is not as readable asit is as a DjVu or a TIFF image, because the DjVu is highly compressed (much more than JPEG) and when you expand it out to a TIFF you still have all the artifacts left from the DjVU compression. When you then re-compress it as a JPEG you get new compression artifacts, which mix with the DjVu ones. Another similar newspaper archive effort I’ve come across is the Northern New York Historical Newspapers project run by the Northern New York Library Network. I’m sure there are many more. Wikipedia has a List of online newspaper archives which is worth checking out. Google operates a newspaper archive search where you can many articles, some of whcih you need to pay to read. The Library of Congress has a project called Chronicling America where you can search historical newspapers between the years 1860 and 1922. You should also try searching for newspaper archives on your favorite search engine. New ones seem to pop up all the time, so if you don’t find one now, try again another time. For Jewish researchers I will point out a few interesting examples of newspaper and magazine archives I’ve come across. There is the Southern Israelite, covering the year between 1929 and 1986, part of the previously mentioned Digital Library of Georgia. Note that while it was published in Georgia, it does cover some other southern states, so if your Jewish family lived down south, you might find some news listed in this paper. There is also the Pittsburgh Jewish Newspaper Project, which includes three different Jewish community newspapers published between 1895 and the present. The Ohio Memory project has put up The Ohio Jewish Chronicle, covering the years 1922 until 1994. 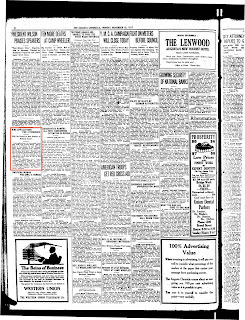 For Chicago, there is a local Jewish paper called The Sentinel, covering the years 1911 through 1949. One very interesting project is run at the National Library of Israel, called the Historical Jewish Press. This project currently includes twenty newspapers, some going back to the mid-19th century, including over 400,000 pages. 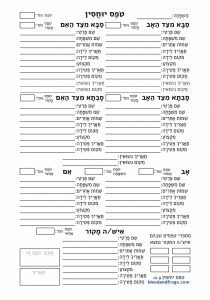 The languages of the papers include Hebrew, French, Hungarian and English. The only English newspaper in the project right now is the Palestine Post, the original name of what is now the Jerusalem Post, and it covers the years 1932-1950 (the years before it changed its name to the Jerusalem Post). The French papers include one from France, but also papers from Morocco and Egypt. The Hebrew papers include ones from Israel, but also papers from Tsarist Russia and one published in Prussia, Poland and Austria. Please, if you know of other good online newspaper sites, mention them in the comments. You can also share your success stories in the comments. For an example of how the information in these types of records are not always reliable, read my earlier post People lie, and so do documents which discussed confirming information found in two obituaries which I found through one of these online newspaper archives. Leslie Ann, thank you. Can you explain a bit about the Newspaper Abstracts site? GeniTales, those are the same papers as the Pittsburgh Jewish Newspaper Project that I mentioned, right? What is the difference on the Rootsweb site you linked to? Joe, indeed that list looks very useful. I’m glad I at least listed all the same Jewish papers that you have on your list. Thanks for these tips. I use Genealogy Bank and Chronicling America, but was not familiar with the Northern New York site or the site Leslie mentioned. They are pretty good about tweeting new submissions. Also, you might want to check out one of my blogs => http://ancestorsinthenews.blogspot.com/ I post newspaper articles there, and in the side bar is a list of other newspaper links. For those researching the UK, The Jewish Chronicle has an excellent archive and it is available online. You have to pay if you want full access to the articles but if you are prepared to be a bit creative with your searches, you can often get all the information that your require, without the need to subscribe to the full service. I have found many engagement, wedding, birth and death announcements lurking in these archives and I am yet to subscribe. The Jewish Chronicle is the UK’s oldest and longest surviving newspaper and the archives are searchable back to 1841. I am sorry that the link didn’t work. you can then click into the archives on the top right of the page.